This article was written by Sydney Frazer. As a Program Manager at Glassdoor, Sydney works with hundreds of accounts across universities, libraries, and blogs, helping provide them with content and tools to aid job seekers and employers. Outside of work, Sydney enjoys running, hiking, and searching for the perfect burrito. When you are about to make a big purchase decision — to buy a new laptop, invest in a backpack for your next wilderness excursion, or upgrade your fridge — you probably do your research. Whether it is checking with friends about a specific brand, reading Amazon reviews, or consulting Yelp, you try to make sure you are making the best decision possible with the information available. If you step from the role of a consumer to that of a job-seeker, not much changes. Job seekers use platforms like Glassdoor, LinkedIn, and Indeed to get a feel for company culture, get ready for interviews, research perks and benefits packages, and prepare for salary negotiations. In fact, research shows that 61 percent of Glassdoor users look at company reviews before even choosing to apply for a job. Given the candidate-driven market, employers can’t simply ignore the reviews current and former employees are leaving on their profiles. The best employers take a proactive stance to reviews by responding to them. And they do this with good reason. Research shows that 62 percent of Glassdoor users have a better perception of a company when they see the employer respond to a review. Ready to start attracting top talent and keep current employees engaged? Consider following these five tips for responding to reviews on Glassdoor. Choose who will respond to reviews. It can be one person or it can be a team. It can be someone in HR, PR, Marketing, or even your CEO. Just make sure responsibility for responding to reviews is assigned so it isn’t forgotten. Develop a schedule for responding to reviews. Whether it is once a week or once a month, find a cadence that works for your team’s bandwidth. Create some templated responses that you can adjust. This will make responding much more efficient. If you have a large number of reviews coming in, develop a prioritization method. For example, The Home Depot said it prioritizes reviews by urgency and gravity. Leaving a review takes time and effort, and this shouldn’t be ignored. 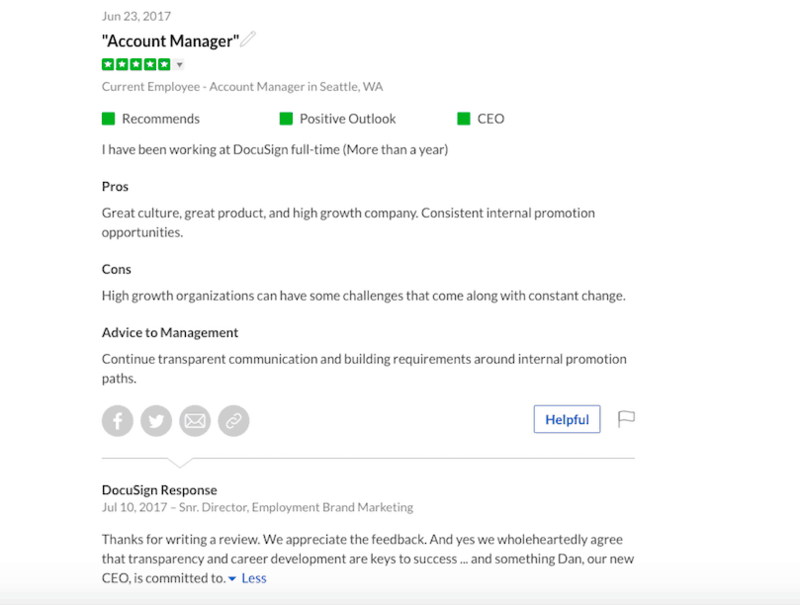 When responding to Glassdoor reviews, DocuSign makes it a priority to thank the reviewer. Whether the review is glowing or highlights areas for improvement, you will find DocuSign thanking the reviewer for sharing their thoughts on the work environment. This does two things. First, it demonstrates to both job-seekers and current employees that you recognize the value of feedback and are open to receiving it, whether it is positive or negative. Second, it indicates that you are paying attention to your reviews. This gives some insight into your company culture. It helps demonstrate that you care about your employees and their experience working at your company. A quick glance at Glassdoor’s Community Guidelines, which are in place to help Glassdoor remain a helpful, balanced, and authentic community, reveals that reviewers are strongly encouraged to leave both a pro and a con. With that said, even the most scathing of reviews will likely include a pro. The best responses amplify these pros, capitalizing on the opportunity to highlight areas of your employer brand that are strong. While it is important to amplify the positive when responding to reviews, it is equally — or possibly even more — important to address specific problems raised and explain what steps are being taken to resolve the issues. WillowTree, which has been named to Glassdoor’s Best Places to Work list for 2016 and 2017, even receives a couple of reviews that raise concerns about the work environment. However, WillowTree doesn’t just sweep this under the rug by ignoring those comments. Instead, WillowTree specifically addresses the problematic areas brought up and discusses what is being done to remedy them. In this specific case, the CEO acknowledges issues regarding termination and explains that they have “redoubled our efforts to make sure that it is never a surprise…” By addressing the specific issues raised, the CEO is able to demonstrate to both current and prospective employees that reviewer concerns are taken seriously and a real attempt to resolve the issues is made. The strongest responses show respect for the reviewer by addressing the review in a manner that is both professional and authentic. Salesforce demonstrates this beautifully in the response below. Salesforce employs the previous four tips, while also responding in a truly genuine way. Cindy Robbins doesn’t get defensive, is extremely considerate, and shows the company’s authenticity in her response. While getting started with responding to reviews might seem overwhelming at first, once you develop a strategy and get started, your company will see the value in it. Don’t miss out on this opportunity to show current and prospective employees that your company is open to and appreciative of feedback, values the employee experience, and is constantly working towards make the work environment better. As a Program Manager at Glassdoor, Sydney works with hundreds of accounts across universities, libraries, and blogs, helping to provide them with content and tools to aid job seekers and employers. Outside of work, Sydney enjoys running, hiking, and searching for the perfect burrito.